My elderly neighbour died last weekend and her belongings were thrown out and many items smashed. I saw this doll in amongst the broken bisque dolls and rescued her- I like dolls. Her son said I could keep her. From a quick google and I carefully took of her (aftermarket) clothes and saw no identifying "maker" features. Her head is moulded composition and lower arms and clneched fist. Painted eyes ad single stroke eyebrow With stuffed body and legs attached crudely.- It looks like she was repaired once or twice. 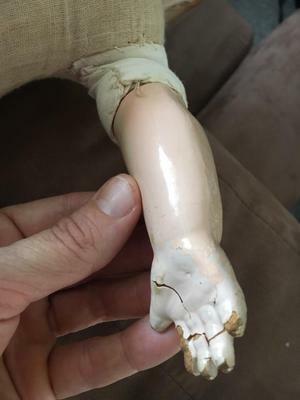 The owner was 98 and the doll is marked with her name in Pen. (UGH) I would like to identify her since she has no obvious maker marks that I can see. Her ears are NOT symmetrical so I wonder if she is hand made? 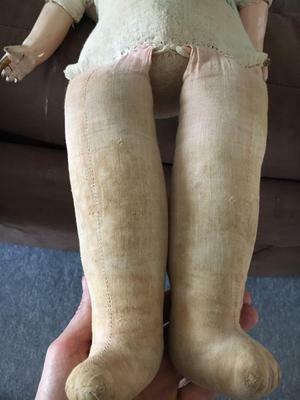 Her limbs are a coarse woven fabric and appears stuffed with straw or maybe horse hair in the torso and maybe wadding in the legs. The leg fabric is different -slightly newer so wondering if they were added later after some damage. There is a black disc embeded in her back and I think it may perhaps say "mama" or the like. It looks similar to the effanbee "mama" doll very close. But not the same and no script on the head and shoulder composite plate.